LOS ANGELES (September 19, 2018) — Yesterday, people gathered to ask Applebee’s to add plant-based entrées to all of its menus nationwide. OMD and the Center for Biological Diversity hosted events at locations in Los Angeles, San Francisco, New York and Clearwater to target the restaurant to make a change on behalf of climate health and biodiversity. At the National Day of Action, concerned eaters served plant-based hamburger samples donated by Hungry Planet, a health-focused, premium plant-based food brand, outside of the Applebee’s locations in Los Angeles and San Francisco. Additionally, customers filled out comment cards and petitions were delivered urging the chain to offer healthy options free of meat and dairy. With over 1,900 locations, Applebee’s is the largest restaurant chain in the U.S. that does not offer a single vegetarian entrée on all its menus. 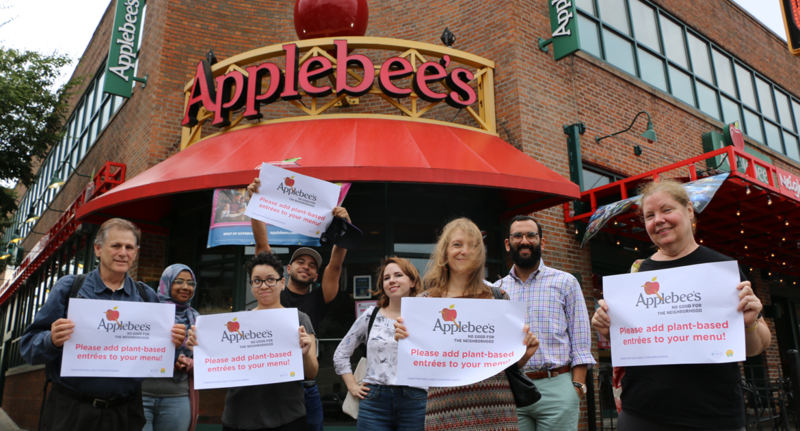 “We’re calling on Applebee’s to make a change to protect people and the planet,” Stephanie Feldstein, Director of the Population and Sustainability Program at the Center said. “Restaurants can play an important role in creating a more sustainable food system, but only if Earth-friendly, plant-based options are available on every menu across the country. ” The day was the kickoff of a larger national campaign targeting restaurants, developed and co-led by OMD and the Center, in an effort to increase access to plant-based foods for better health and to take action for the planet. Together the organizations will support individuals as they advocate for menu change across the country. Animal agriculture is a leading cause of climate change, deforestation, biodiversity loss and water usage and pollution worldwide. Eating excessive animal protein comes with increased risk of chronic illnesses including heart disease, diabetes, and some cancers. Our planet is hungry for creative, sustainable ways to feed our rapidly growing human family. At Hungry Planet™, we set out on a mission to deliciously match traditional meat textures and tastes with healthy plant-based ingredients. After more than 10 years of R&D, we are the first and only company to develop a full range of premium plant-based meats that handle, prepare, cook and taste like conventional meat. For more info, visit: www.hungryplanet.us.